I simply adore Focaccia Bread. It is simple to make and there are endless combinations of toppings waiting for your imagination to compose. 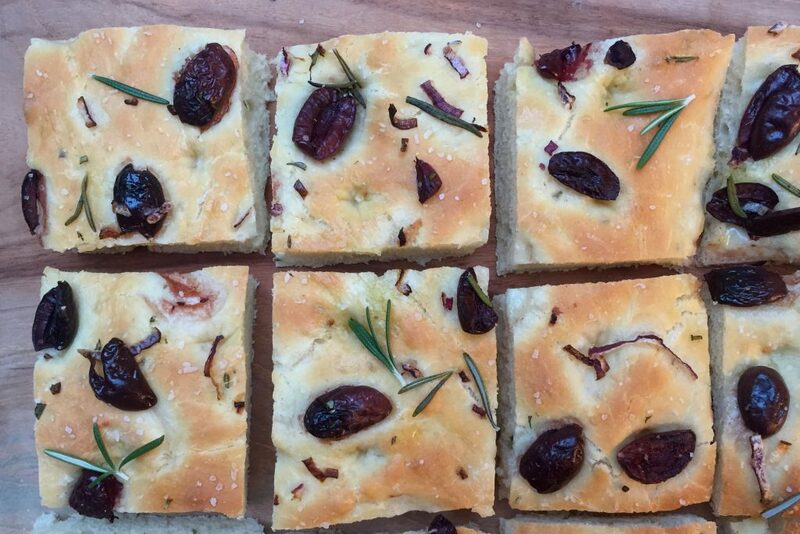 Focaccia Bread with Olives and Rosemary is probably the one I make the most often. Kalamata olives with fresh rosemary and a sprinkle of course salt hit just the right notes for me. I love to serve it with a roast chicken or a steak off the grill. 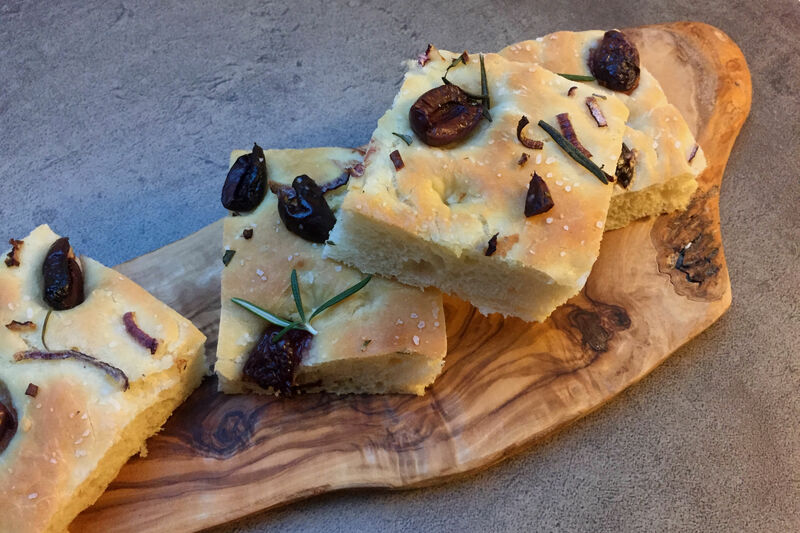 Homemade focaccia bread adds a little something special to an otherwise simple meal. Focaccia is a yeast bread. If you are a bread maker then you already know that this recipe will be a snap to make. If not, then I urge you to give it a try. Do not be intimidated by the idea of using yeast. You simply pour some from a packet into warm water, wait 10 minutes for it to froth up a bit, then proceed with adding in the flour. I am busy as I am sure you are, so I tend to let my stand mixer knead the dough for me. So easy. Now I realize not everyone has a stand mixer, (see notes) but please do not let that stop you from making this focaccia bread or any type of bread for that matter. Kneading by hand takes all of 10 minutes and is actually very therapeutic. It can be very “zen like” and you get to feel like a real baker. The time involved in making focaccia or any yeast bread is more about the time letting the dough rise. You do have to plan ahead but keep in mind that your “active time” is very limited. 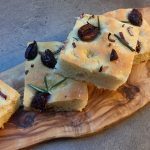 This focaccia recipe has a total rising time of about 1-1/2 hours so you could start this mid-afternoon and have it ready by dinner. One last note. This makes a lot of focaccia bread. A whole sheet’s pan worth. It’s perfect if you have a large family or you’re planning it for a party. If not, simply wrap up what is left and it should keep for a few days. I actually take a few pieces at a time and heat them up in the oven for a couple of minutes. The focaccia gets all warm and soft again like it was just freshly baked. Add in the salt, the olive oil and 4½ cups of flour to the bowl. Turn on the mixer and let it knead the dough for at least 3 minutes. You are looking for a soft ball of dough that is a little sticky. Add more flour as needed if it seems too wet. Take the dough out of the mixing bowl and knead it by hand for another minute on a floured counter top. Shape into a smooth ball. Place in a clean bowl that has been oiled with a little olive oil. Cover with a kitchen towel and let it rise in a warm place for 1 hour or until it has doubled in bulk. Take the dough and place it on a clean board or counter top that has been sprinkled with a little flour. Knead the chopped rosemary evenly into the dough. Take some olive oil and liberally oil a large sheet pan (about 15" x 10"). Press the dough into the pan until it is evenly spread out, covering the entire pan. Cover the dough with a kitchen towel and let it rise again for about 1/2 hour. Preheat the oven to 400° F.
Using your fingers, make multiple random "dimples or indentations" into the dough. Brush the top of the dough with some olive oil and then top with the olives, onion and the whole rosemary leaves. Sprinkle with the course salt. Bake for about 40 minutes or until the top is golden brown. Transfer to a cooling rack and let cool for about 10 minutes. Tastes best when served warm.